In the day of the samurai, the concept of cultural values was very important. Culture was an unwritten, unspoken principle guiding the lives, and decisions of ancient Japan’s sacred warriors. We’ve developed our own Dragonfly Culture anchored by a belief in a set of five cultural values. Our Cultural Values set the tone for the tough decisions we make daily. They give us tools to help recognize the greatness within our doors—in both our teammates and our customers. It’s through our Cultural Values that we’re able to embrace Kaizen, improve our guest experiences, and grow the talent of our team. Consider it Done: I own and share our key results and make timely decisions to achieve them. When a task needs to be done, we do it. One example: It’s raining cats & dogs (which it does daily here in the Sunshine state). One of our hosts grabs an umbrella and walks people to their cars – that’s what Consider it Done looks like to me. Solve It: I proactively solve challenges with creative solutions. Challenges are a fact of life that face everyone. They pop up out of nowhere. Challenges (big and small) can become a drain on morale and productivity when left unchecked. We empower our team to prevent this from happening. One example: Our produce delivery is late on a heavy prep day, and it’s getting close to opening. Instead of ignoring the issue (or just 86ing items or the evening) our prep team solved the problem. They went across the street and purchased the vegetables needed to hold us over until the delivery arrived. By recognizing the problem and then taking the initiative to own it, we were able to provide a complete menu to our customers–that’s what Solve It looks like to me. 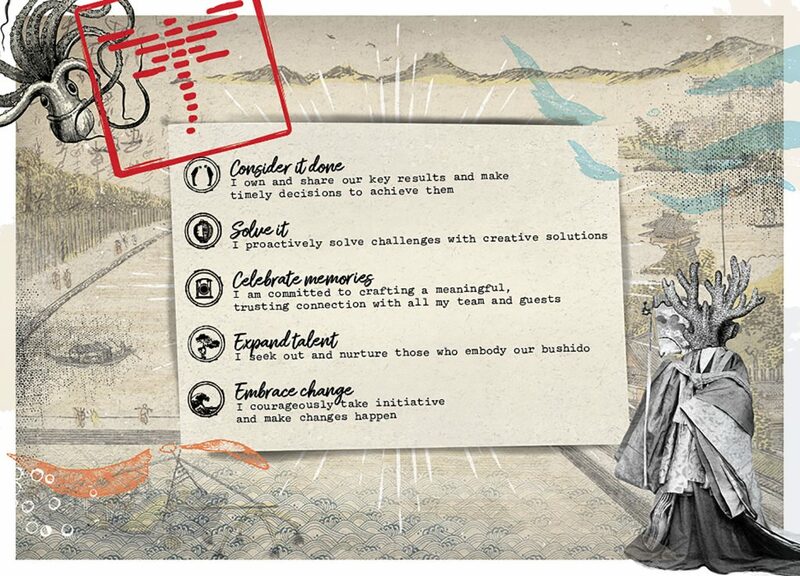 Celebrate Memories: I am committed to crafting a meaningful, trusting connection with my entire team and every guest I encounter. Who doesn’t like to celebrate? Trick question…we all do! But, we make a point to celebrate with purpose whenever possible. One example: Our sushi chef hears that the guests seated in front of him are celebrating a promotion. To make the occasion more memorable, he presents them with a special dish (on the house) and congratulates them on a job well-done. The dish is a small gesture, but completely unexpected. It created a connection between our guests and our team– that’s what Celebrate Memories looks like to me. Expand Talent: I seek out and nurture those who embody our Bushido. We nurture the talent and passions of our team, and the team is more engaged. The benefits of engagement are felt three-fold. By the individual as a sense of pride and accomplishment, our teammates who get a stronger team, and our guests who get a higher quality product and better over-all experience. One example: Our Robatayaki Chef’s recently spent time with our Sushi Chefs working on knife and cutting skills. The time our Sushi Chefs spent sharing new cutting techniques allowed our Robata Chefs to get through their prep work more efficiently. This freed up more time for collaboration which led to new menu items for our guests. It was a win-win-win—that’s what Expand Talent looks like to me. Change isn’t easy. It’s uncomfortable. It’s scary. And, it’s hard. We all tend to avoid change for these reasons. Our Bushido teaches us to embrace change because, without it, we cannot grow. Our team is exceptional at embracing change. One example: Dragonfly Orlando recently underwent a pretty big shakeup with management when our GM of nine years (over ten with the company) expressed an interest to explore other career options. Thorugh the help of our ownership group, we were able to help him transition to another (much larger company) giving him the opportunity to expand his talents. This change allowed us to promote within, so the entire team had to embrace lots of change–a new GM, a new Chef de’ Cuisine, and a new Sales Manager are now steering the ship. Even with the shakeup, we are still running strong and growing. That’s what Embrace Change looks like to me. Our Bushido and cultural values have helped us make friends and fans of almost every guest who dines with us (nobody’s perfect), and we’re looking forward to making many more friends and fans as we continue to grow. Next Post: What is the Dragonfly Way?